Having sold more than 100 million records worldwide, The Who are one of the top three greatest rock legacies in music history. Emerging in the mid-1960s, their brash style and poignant storytelling garnered them one of music’s most passionate followings and the band was eventually inducted into the Rock and Roll Hall of Fame in 1990. The Who have 17 Top 10 albums – including the 1969 ground-breaking rock opera Tommy. Their anthemic back catalogue of hits includes I Can’t Explain, The Kids Are Alright, My Generation, Baba O’Riley, Won’t Get Fooled Again, Pinball Wizard, Who Are You and You Better You Bet. Now, The Who’s Moving On! show at Wembley Stadium will see Pete Townshend and Roger Daltrey joined by symphonic accompaniment on 6 July for a huge one-off show. Special guest Pearl Jam’s Eddie Vedder will also appear. Plus, support comes from Leeds indie rockers Kaiser Chiefs, as well as Imelda May, the Irish singer-songwriter who's known for tracks such as Mayhem and It’s Good to Be Alive. More acts are still to be announced. On stage, the line-up will be rounded out by familiar Who players featuring guitarist and backup singer Simon Townshend, keyboardist Loren Gold, bassist Jon Button and drummer Zak Starkey. 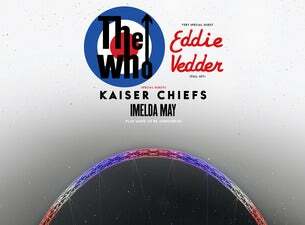 The Who are also gearing up to release their first album of new songs in 13 years.